Later this month I’m going to do a youth ministry night for our teens on Having a Daily Faith. It’s going to be all about the habits we need to create related to our faith life, that holiness doesn’t happen by accident, and we need to be intentional about what we do. So I’m going to blog about some of the daily faith things I do to keep my faith the center of my life, instead of letting it hang out in the fringes of my week. My intention of sharing is to show you how one person lives out this life and hopefully inspire you. It is not to boast, to say you have to do these things to be a good Catholic, or even to judge you for how you live. I hope you’ll enjoy walking on this journey with me. For many years I’ve been doing the other things I’ve talked about here and known I should be reading the Scriptures more. So for Lent about 3 or 4 years ago I decided to start on a “Read the Bible in a Year” plan. I read every evening according to this plan from that Meg posted. It took me a little more than a year to complete with travel and forgetting my Bible at home but I did finish before the next year’s Easter. Then I promptly stopped reading the Scriptures. I didn’t even prepare for the upcoming Sunday Mass readings, not that I was doing that before I started the plan. A few things happened in the past year. A friend told me about a ministry she and a few other youth ministers started called Carpe Verbum that I subscribed to and started reading. Each day there’s a Lectio Divina reflection on the readings of the day. You may have noticed that I write for them too and post it on my blog that same day, just the reflection portion. I have also recently taken on a larger role in the ministry by preparing one of the posts each week. This along with the daily Blessed is She email and reflection have become part of my morning routine. Although I don’t read the readings, I do reflect before I go to Mass and hear them [still not scripture reading, I know]. For Lent I decided my “prayer” thing would be 15 minutes of Scripture reading and silent prayer before bed. This is when I really got started. When I was trying to determine what to read, I pulled out my new Catholic Journaling Bible and just started with the chapter and verse that they have popped out and written very beautifully (like in the image at the header of this post). I would read that, reflect, and have silent time. I didn’t think this would be a game changer or anything dramatic for my prayer life. It really has though. It’s given me 15 minutes of time to set aside in prayer that’s not scripted or wrote every evening. The words haven’t been formed by someone else (not that those are bad prayers, I do them all of the time! ), but it’s just me, the Lord, and His Word. One week I reflected on the same psalm every evening, trying to bring it into the reality of my heart. On Easter I began the Gospel of Luke and then Acts of the Apostles as my reading. After the Ascension I started the book of Ephesians. I find that one chapter, or one book, is better for me though. So I reflect and pray, rather than read it like a novel or a book. Reading 5 chapters of the Gospel isn’t really what I’m looking to do each evening. More like reading a passage, reflecting on it, and praying through it to apply it to my daily life. It’s not easy to do – and even a few months in I have to confess I set a timer. Otherwise I’d pray for like 4 minutes and call it done but I want to be committed to more time. After many years of doing just those basics: Mass, Morning & Evening Prayer Time, and the Rosary – I decided I needed something more. Okay, that’s not exactly true. A priest I went to for Confession decided I needed something more. He told me I needed 15 minutes of extra prayer time each day, something I could do by going to Mass early. He probably intended that to be silent prayer – but that’s not really how I interpreted it and made it part of my life. I decided to do some spiritual reading, and in the 15 minutes before daily Mass. I’d leave my house at about 5 to 12 instead of 12:10 so I’d have time. I started with The Noon-Day Devil, a book I’d purchased about 5 minutes after leaving that confession experience when he told me I should try to battle the bad habit of acedia. What is acedia, you ask? Well, it’s commonly known now as sloth, but really a terrible vice where we allow the devil to let us think we’re doing enough, we aren’t ever going to be enough, and that God isn’t enough for us. Sounds like the little issue I have with the word enough already. Basically sitting in complacency and even worse, not desiring good and holy things any longer. It’s one of the reasons I started this whole year and quest to become perfectly myself. Setting myself on track with good, holy habits rather than mind-sucking terrible habits (ie: laziness and binge watching tv). So spiritual reading it was. Filling my mind with good and holy things. After that book I read Little Sins Mean a Lot, Jesus: The Story You Thought You Knew, The Extraordinary Parents of St. Therese, How God Hauled Me Kicking and Screaming into the Catholic Church, You Can Share the Faith, All the Pope’s Saints, Tuned In, Strange Gods, God Listens, A Second Look, and The Miracle and the Message. These all have super long subtitles, FYI when you look them up to read. Also most of them are published by my employer. I get them all in the mail for free every month! Right now I’m reading Stunned by Scripture. Keeping the stories of the saints, wisdom from holy people, and just great spiritual things in my mind each day has really helped me stay closer to the Lord. We all need spiritual reading of some sort because we need great holy wisdom in our lives. The stories of someone who’s lived through it and is here to tell the story. It helps when we can learn from other people, take those things that worked for them, and apply it to our lives. We cannot live the life of a Christian alone, we were never meant to do so. We were meant to go out together, learn from one another, and lean upon one another. A few weeks ago a few friends and I went to hear Jennifer Fulwiler speak when she was in Charlotte. She was talking about what we need to pursue our dreams, and one of those things was a “village.” We were not designed to be alone in this world, and we need to build out our villages. One of the ways I do this is through spiritual reading. My “village” is made up of these spiritual powerhouses who keep me grounded, inspired, and on the right path. When I first moved to the Charlotte area, one of the Friday evening speakers at the Eucharistic Congress was Immaculée Ilibagiza. The short take on her story is that she was hidden in a bathroom 3×4 feet with 7 or 9 other woman during the war in Rwanda. The got through it by praying the Rosary every day (17 times in fact) and teaching herself English by reading an English Bible. Of course there was much more to it, but hopefully that’s enough to go learn more about her story in her book Left to Tell. After that I was inspired to pray the Rosary more. I started with just a decade a day. This was about the same time I made the commitment to pray at my bedside each morning and evening. Then a woman asked me if I wanted to get married and what I was doing about it. She told me I had the pray the Rosary every single day, the whole thing, if I wanted to get married. I think she thought it was a special formula … it’s not, well, it wasn’t for me anyway – 10 years later, still praying the Rosary and still single. The point wasn’t that it was a magic formula, but that I was entrusting my future to the Blessed Mother and her Son. To change my plan, my heart, my desire into their desire for me. So the Rosary has been off and on (more on than off) part of my daily faith journey. These days though I more often than not pray the Rosary with a handy little app. I listen to it each morning on my phone after my morning prayer before my morning walk … well, during the time it takes me to get ready for that. I like this version because it’s simple, easy to follow along with, and doesn’t require data or wi-fi (I don’t think). It makes this daily habit easier. It also means I don’t get distracted thinking about something else. The voices bring me back each and every time. I don’t think it’s cheating or wrong to have technology help us in this way. I think that’s why the Lord gives us all of these things. So why should we pray the Rosary every day? Well, Our Lady of Fatima asked us to, that’s the first reason. Second, we reflect on the mysteries of salvation when we do, following along the ways of the Lord from his Annunciation to His ministry and the Proclamation of the Gospel to His Death and Resurrection to His Glorious Ascension! We walk with Mary, the human being closest to Him through all of this. She continuously brings us back to her Son to glorify Him. Sometimes I forget why I’m doing it, but I always remember once I start again – I’m doing this to break out of my world and get a small glimpse into His world again. It takes me back to when He was on this earth walking, talking, and being like us in all ways except Sin. My daily Rosary reminds me that Jesus was a human being with a human mother who loves me so much He died on the cross to save me. I’d like to begin this week by saying that I’m not writing these to say “if you aren’t doing these things you aren’t a good Catholic” or “look at me at all the things I’m doing to pray.” The purpose is to reflect a little on the ‘why’s’ behind what I’m doing for myself and to share what a daily faith life can look like. So many times people don’t even know where to begin. Although I started with Daily Mass, I think that Evening & Morning Prayer time is actually a better place to begin for those of us who want to dive a little deeper. This was a great starting point for me that has since grown. I’m also part of a Facebook prayer group (even though I quit FB) where we pray 3 Hail Mary’s each day for the intentions of those in the group. So I added those 3 Hail Mary’s. Then over time many other things have become part of these few minutes: the long form of a Marian Consecration renewal, a perpetual Novena to St. Joseph for my future husband, my friend’s spouses, and my godsons, the priests of my life by name (an ever-growing list), a quite daily offering, and a prayer for the men & women I’ve encountered who are homeless. Now that’s not the only reason – but I don’t want the devil to think he’s got the upper hand on me, ever. I want to “punch him in the face and send him back where he belongs, right down to hell.” Beginning my day by offering myself to the Lord, framing my day with Him at the front, and thinking about Jesus before anything else gives me the frame of reference I’m looking for. Beginning with Him, Ending with Him – both intentionally makes me much more likely to keep Him in the middle of my day too. My junior year of high school (just a few years ago, so many I cannot remember), my friends and I decided we would go to morning Mass before School. The options in our home town for daily Mass are pretty varied if you don’t need to get on the bus at 7:15am for your read job – school. So the only option was 6:15am Mass at my parish (there are 3 in town). So we got up super early and went to Mass before school, trading off driving since none of us had our own cars, and it was sometimes before the sun came up! I’m a morning person once I’m out of bed, but how I got up at 5am every day to go to Mass as a high school student, I’ll never know. This is when the habit began for me though, when I was 16; half of my life ago, actually. When I was in college it got a little easier. There was a noon Mass and an evening Mass, if I remember correctly, in our student chapel. There was also the option of attending with the monks early in the morning. At that time in my life, the habit was regular weekday Mass, at least a few times during the week. I didn’t make it every day, but really wanted to, just didn’t rearrange my schedule well enough to make that happen. One year I became the Monday, Wednesday, Friday daily noon Mass sacristan, so that helped a lot. I also spent many an evening at Vespers with the monks. A friend and I would meet each day, go down for prayer, and then head to dinner. It was quite a lovely time, to be honest. Might be the reason why we’re still friends today actually – and why he’s now a monk. After college it got harder. I moved home, got a job at the county jail (a story for another day), and was only able to go a few days a week when I was volunteering for our youth ministry program. The time were a little better for me though since I didn’t have to be at school quite so early, and I had my own car! About a year later, I attended the Life Teen Youth Ministry Conference out in Arizona. The job I got in North Carolina wanted me to go as a part of the training process, and so I flew out for the week with my new boss. I remember distinctly something that Mark Hart said about daily Mass, ministry life, and us. He told us that we can’t give what we don’t have, and also to not walk past the chapel every day at work without going in. I made a commitment that day to attend daily Mass as often as possible while I was doing ministry. The parish I worked at had Mass at 9am every day, the perfect time before work. It became my habit – Mass then work each morning. I lived really close to the parish so I could even go on my day off. When I got a job at a parish across town, I kept up the habit and even had a noon Mass I could attend instead. Youth Ministers love noon Masses, more time for sleeping! When I transitioned to being the office manager, I made it part of my day. How could I go to the Church every day for work and not go to Mass? Some people in my office would say “I’ve got too much to do.” I’d reply and say that’s probably why you should be at Mass. Once I left parish work, I let the busyness of my day take over and missed weekday Mass a lot. I was working from home, setting my own schedule, and still couldn’t take the hour to leave for noon Mass, even when the church was just 6 minutes away. The first Lent I worked at my current company, I decided to attend daily Mass, use these 6 weeks to re-form the habit I desperately needed in my life once again. It worked. I blocked out the hour from noon to 1 on my calendar with a recurring meeting. Nothing could get scheduled there if something was already scheduled! The saints tell us that this is a sure-fire way to holiness, I want to be holy, so I’m making it a habit to do. Even in the midst of being busy at work, traveling a lot, and having a hundred other things that I could be doing. They can all wait. It’s Jesuitical from American Media. I stumbled upon it a few weeks ago and have listened to most of their back episodes, which definitely means that I’m liking it (also I’m a podcast junkie). Ashley, Zac, and Olga are in their late twenties and are often saying things I’m thinking about the Catholic world. They start each episode with the Signs of the Times where they look at Catholic News from the week, followed by an interview with a great Catholic or other cool human being, and concluding with their consolations and desolations, sharing where they found God this week and where it was harder to find God that week. I like them because they are relate-able, young, and Catholic saying the things we’re all thinking and get better and better after each episode. I think it’s nice to have a young voice sticking up for the Church and talking about issues in a better light for the Church. Some of my favorite episodes so far are the interviews with Lino Rulli, Molly Burhans, Claire Swinarski (her episode was how I was introduced), and Michael O’Loughlin … just a couple to get you stared! 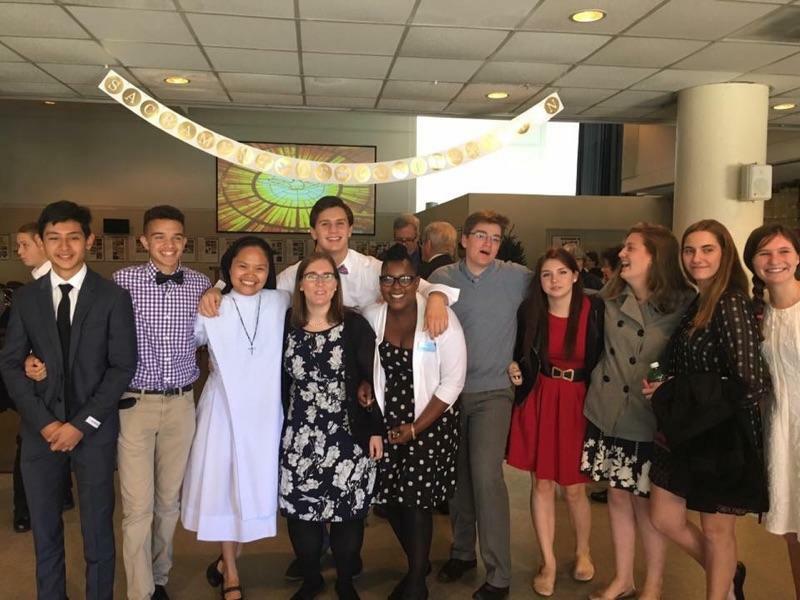 I have a confession to make: When I first started as the Middle School Youth Minister at St. Mark, I didn’t know what the seven gifts of the Holy Spirit were or how many fruits there were … and I was the Confirmation Coordinator. I didn’t learn those things until about 30 minutes before my first Confirmation Parent/Candidate Sessions a year and half into the job either. And I did not actually learn all twelve fruits until about 3 years ago. These are just two of the things I make my students memorize and learn now. Yesterday, my 8th class of Confirmation Candidates were just confirmed. My team has changed. My level of responsibility has changed. My parish has changed. My job has changed. And my understanding of the Sacrament of Confirmation has changed. This year’s group was prepared by some adults, some teens, a nun, and me. Quite the group! I cannot believe that I’ve seen almost 600 students confirmed. Through it all each class has gotten better and better. They know more and more coming into 9th grade. This year’s group had a great understanding of the basics of the faith when they entered class with us at the end of August. So we were able to have more fun with them as the weeks went along. Did we make an impact on them? I don’t know yet. Only time will tell if they see this as a foundation on their faith life. I do firmly believe that as teachers of the sacraments, we are only planting seeds. We only plant the seeds and water them, to hopefully see them grow and flourish over the course of decades. I remember my own Confirmation. I was a junior in high school and can remember it distinctly. I chose a sponsor was good friends with my grandmother, who’s name I chose. That man has since passed away, probably doing more for me and my faith than he was capable of while here on earth. Daily I remember him at Mass along with my grandparents, asking them to cheer me on my faith. To continue to water the seeds of faith that were planted so long ago and are hopefully now trees producing beautiful fruit. p.s. And now I know the gifts and the fruits and the difference. There are some songs (or here) that make this memorization a little easier. just need to add in Chasity, Modesty, and Generosity to the end to learn them all … and that’s not as easy as you think!